Hi there once again! Time for our thrifty series, #4! 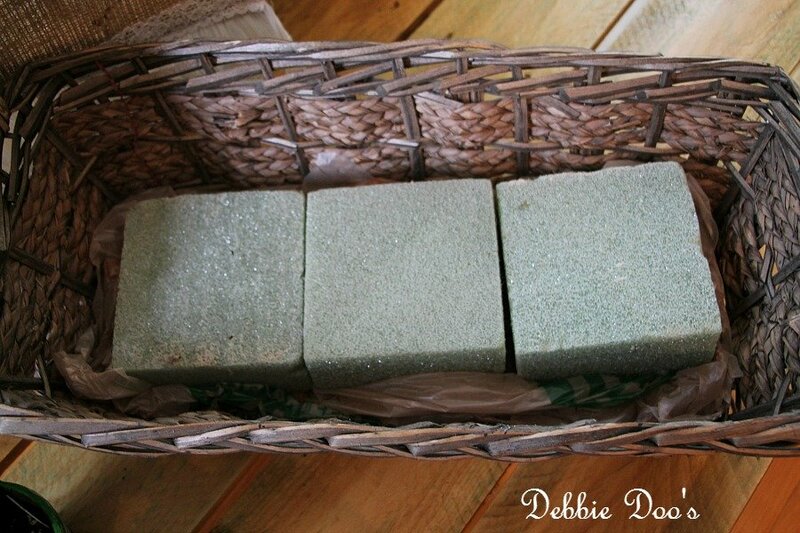 Today, I am sharing how to make an herb basket for the kitchen. 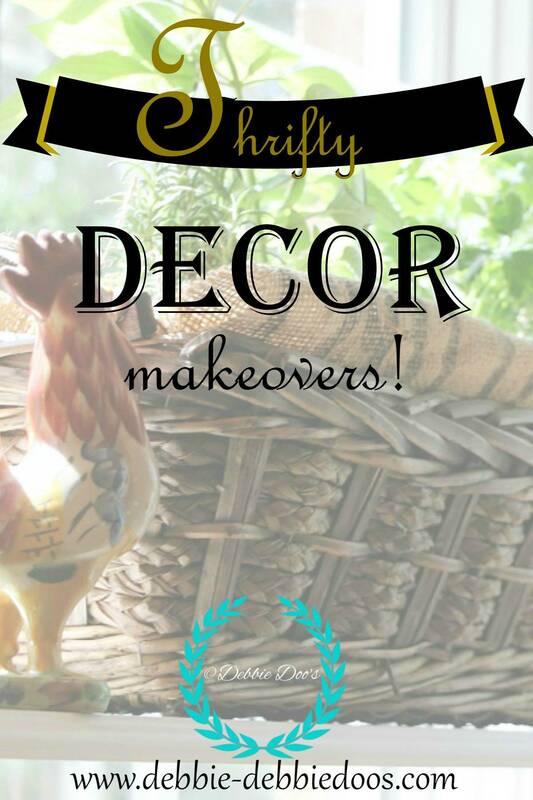 If you missed the first one Rooster caddy second: Thrifty chair makeover third Kitchen art gone to the porch, you can go check out those thrifty makeovers. Meet the gals who participate each month. At the end of the post I will have all their thrifty finds listed so you can pop on over and visit them. This month we don’t have the whole team with us..sorry, tis that time of year. This series is a lot of fun for me because for one I get to go thifting and for two, you start to think outside the box when you are on the hunt. I scored this large basket for $2.99. I loved how chunky and sturdy it looked. I wasn’t sure what I was going to do with it. Then, I thought I would create a fresh herb garden on our kitchen shelves. Perfect spot with all the bright natural sunlight to grow herbs. First thing I did was line by basket with plastic grocery bags. I have about 4 of them in the basket. Then I added the foam cubes for height. Like I mentioned the basket is really large and quite deep. Thanks for stopping over today. 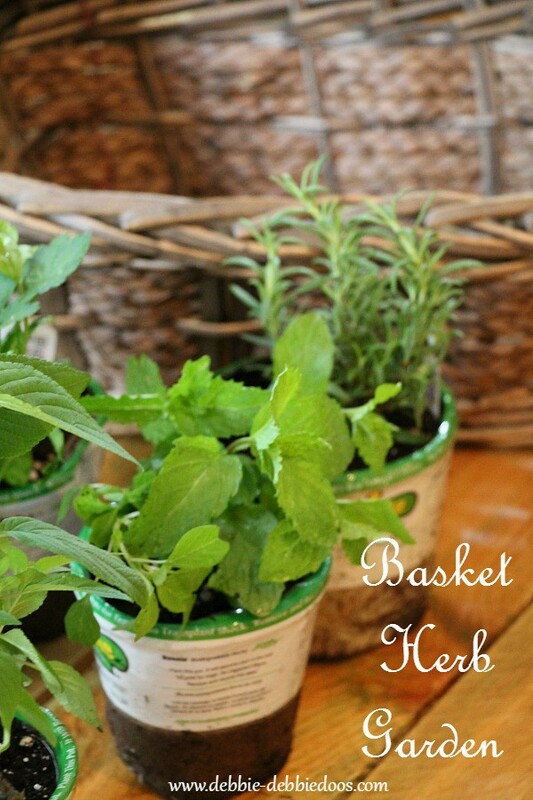 And that’s about how simple it is to create an Herb basket for your kitchen. My kitchen and family room are actually in the process of being painted. Bye bye yellow toned walls. If you missed the family room reveal you can check out the new color here. It looks totally different. I even found some new cute valances. Can’t wait to share. Please stop by the other gals and check out what thrifty makeovers they have for us today. I share all things, heart, home decor and a recipe or two! I just love your kitchen. 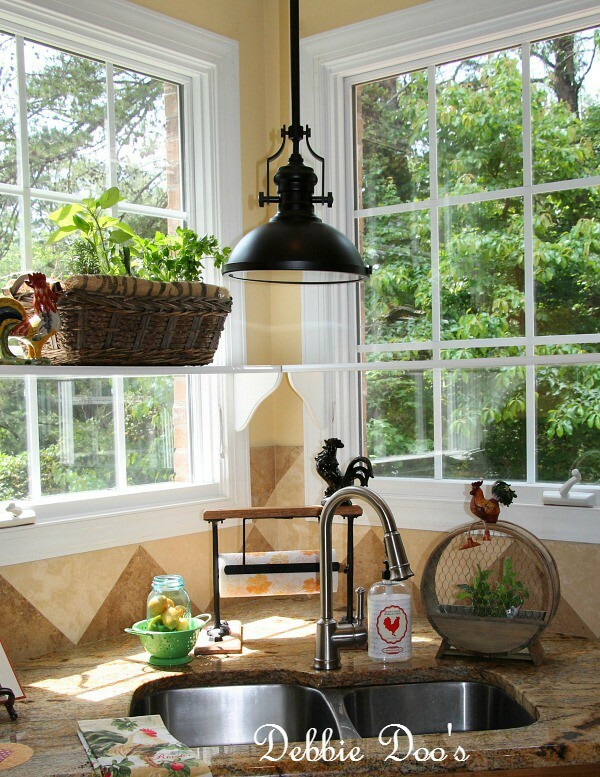 Tha shelf in the window is so creative for your roosters and growing herbs in the kitchen. Love that burlap liner! I like this idea. I’ve always wanted an herb garden but I don’t have a green thumb 🙁 . 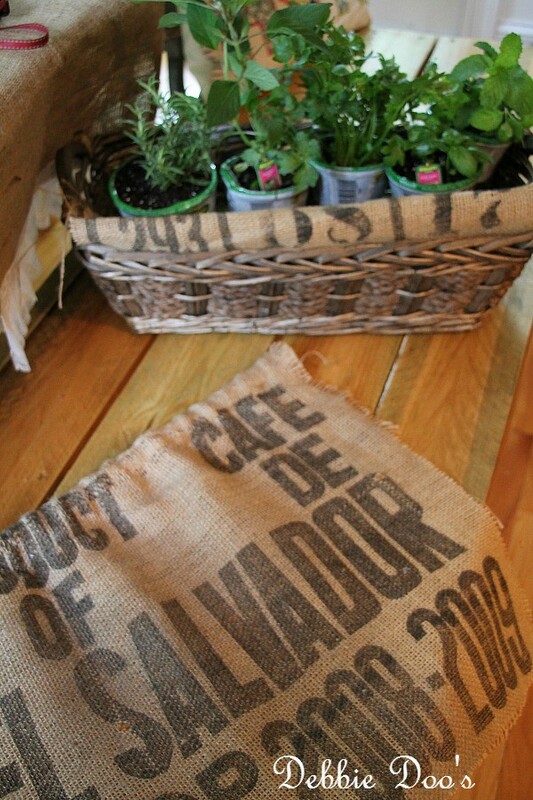 I like the burlap idea too! What a great basket & LOVE it with the burlap… super cute! How pretty is that, Debbie! I love the coffee sack you added. Your shelves by the window look like the perfect spot to grow some herbs, too. I really love the idea! 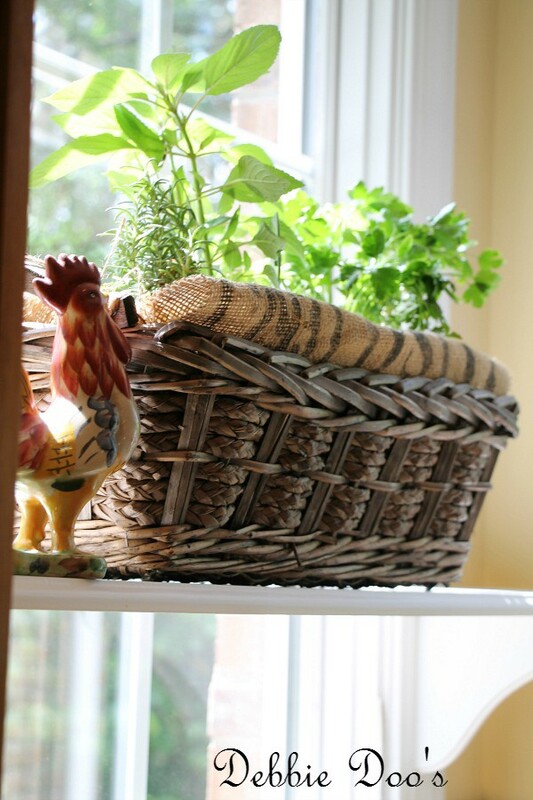 a basket near my kitchen windows with herbs would be perfect for me! Thank you so much! Love the herb basket. Nothing better than cooking with fresh herbs.